Who wouldn't want to go on a Kenya beach safari? The Kenya coast has the almost archetypical paradise setting – soft white sand beaches with palm trees – but still it’s a lot more exotic and small-scale than your average Mediterranean beach resort. Moreover, all the cultural and historical treats of the Swahili coast area are very near, as well as the huge Tsavo safari parks. Add to that all the water sports that the coast has to offer. So if you had enough lazy lying on the beach after a few days, there’s a lot of interesting stuff to see and do. For Kenya beach tour and safari package deals I always advise people to check out Africa Guide. They are much more knowledgeable about Kenya than the average Western travel agency and have put together some very interesting package deals – currently over 160 safari and beach holidays. If you’d rather create your own Kenya beach safari package by booking separate hotel nights, tours and/or domestic flights, then Africa Point (don’t mix them up!) has the strongest cards. 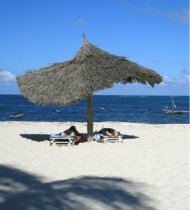 This friendly Nairobi travel agency offer by far the widest range of quality beach resorts online, and it has a good reputation for patient customer service and putting personalized travel packages together. Many visitors combine a beach holiday with a safari to one of Kenya’s well-kept national parks. If you can afford a domestic flight ticket, then basically all the Kenya national parks are within easy reach. The best place to look for domestic flights is, again, Africa Point – they offer flights from most quality domestic air services in Kenya. If you’d rather stay close to the ground, then your best option is generally a safari in Tsavo East or West. Those are very close to Mombasa, and because driving on the terrible Kenyan roads can be very slow, you have to pick your routes sensibly if you’re traveling by car. Tsavo East and West are one of the biggest wildlife parks on earth – together they occupy some 22,000 square kilometers. Next to luxury safari lodges, it also has a lot of budget camping options available. Tsavo is especially elephant country, but giraffes, lions, black rhinos and buffalos can also be spotted here. The wonderful Lamu Island is a UNESCO World Heritage site because of it's beautiful Old Town. Lamu doesn’t have motorized vehicles, only donkeys, so it has a wonderful slowness of life. The rich history of the Swahili coast, which has been invaded by are also comes alive in Mombasa’s Old Town and Fort Jesus. The intruiging Gedi Ruins are the remains of a thriving Swahili town. Rising in the 13th century, this town traded with peoples all across the world. It turned suddenly into a ghost town in the 17th century and it’s still a mystery why. Kenya offers some world-class diving, with beautiful coral reefs, exotic fish and excellent visibility during the diving season (March-October). The coral reefs can also be viewed through glass bottom boats, leaving from many Kenyan beaches. Wind surfing has been done in Kenya since the 1970s, but some beaches are now also making a name with kite surfing. You can hire a traditional dhow (Swahili sailing boat) with crew for trips ranging from an hour to several days.